Once again we had another amazing meeting – thank you! It was our first meeting not at Satin Moon and while we missed Linda's hospitality, it sure was lovely to have more space. We will also finesse some details for future meetings now that we know the space a little better (design wall anyone?!) And once again, this was our biggest meeting ever. If you were a visitor we hope you enjoyed yourself and that you come back again. Our new meeting place, with a chair for everyone! We will get to show and share pictures soon, but first we wanted to give a loud THANKS! to all our sponsors. We had seven door prizes from local, and not so local, businesses. Please let them know you appreciate their support next time you are in their shop. Cloth Castle – Jennifer H.
Gala Fabrics – Judi A.
Buttons N' Bows –Laura M.
Fibre Expressions (in Sechelt!) – Jennifer W.
Calico Cupboard – Kim H.
Fourth, the regular show and share. L-R: Judy, Nicole, Marilyn, Nancy. If you are still finishing your bag or weren't at the May meeting, bring it to the June meeting! Well done everyone, and congratulations to Susan! Her quilt was accepted to the "Modern Metallics" exhibit at the "Quilt!Knit!Stitch!" show in August, presented by International Quilt Festival in Portland. Ed: We wish we had space (and time!) to write out everyone's story or anecdote about their quilt or their process. Those are what makes show and share so much fun. Lisa's "If Pigs Could Fly". 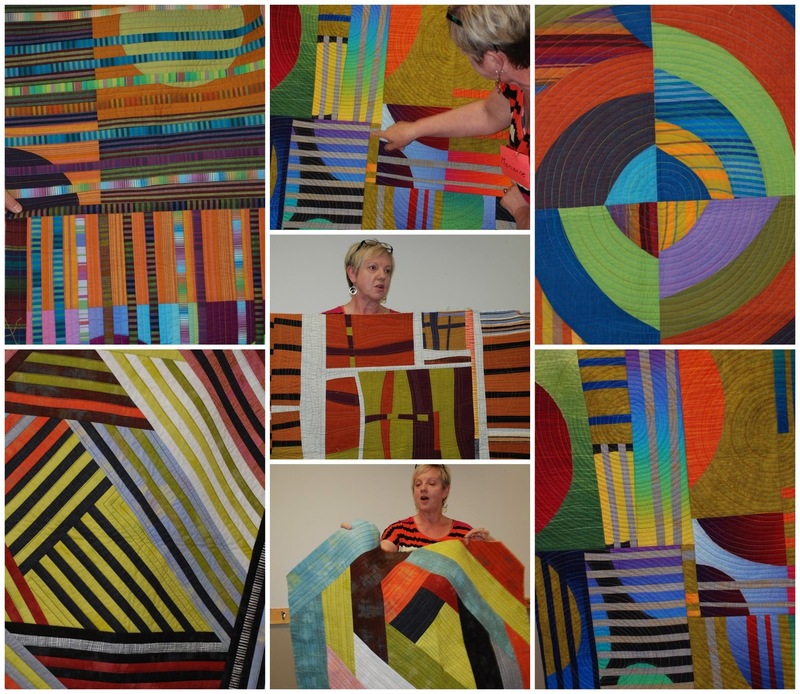 She said that when making this quilt she visited every single quilt shop in town and got supplies or advice from every one of them. We are lucky to have so many shops to help us! Lois's Ladies. She based this one on a large painting which hangs at Murchie's. It won a ribbon in its category. Rhonda's grandmother's quilt. Her grandmother made the dresden plates in the 50's. Rhonda has had them for a decade but finished the quilt recently and is thrilled to have something from her grandmother. Jennifer's Beach Glass. It took a second place in the Modern category. Large Quilt, Viewer's Choice, and CQG best in show. Anne's Tula Pink Stacks quilt with excellent FMQ all around. Congratulations to everyone in the Victoria Quilt Guild on a beautiful show! Anne's traditional/modern. Lovely swirls in the quilting! Donna's quilt as you go project she did with a young neighbour girl. 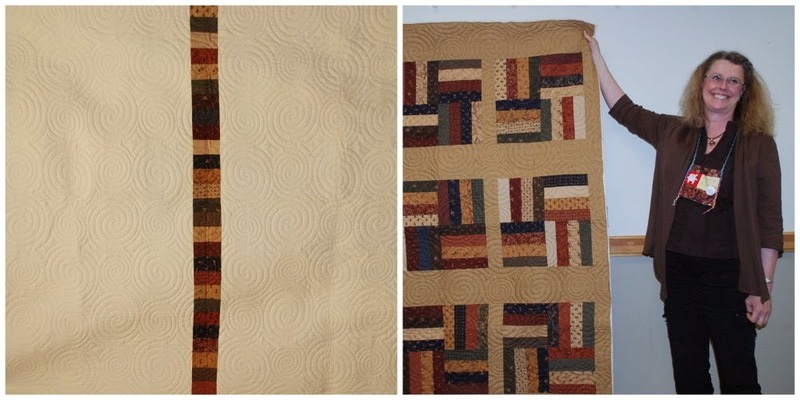 Shown are both sides - a truly reversible quilt! Lavern has finished her entry for the Michael Miller challenge already. Our March guest speaker Marianne is teaching a quilt as you go workshop for the Vancouver MQG and did a super quick demo of lots of different styles of QAYG. We would like to have her present a workshop for us as well. Gabrielle started eight x&+ blocks from the March BOM but liked them so much she kept them, and kept going. Rosalie's really awesome value flying geese quilt. Jo-Anne's small couch quilt/throw made from a pillow and over a long period of time. Ask her about the story sometime - it's hilarious! Bryan's Christmas sample for the shop. Kim was the happy winner of the BOM draw in April! Kim peeking out from her quilt. Geri showing us a save from a block of the month she participated in but didn't like. The reverse of all the blocks is in bright, modern fabric, and she FMQ on each one. Kathleen saw a technique at the VQG show and is enamoured of it. 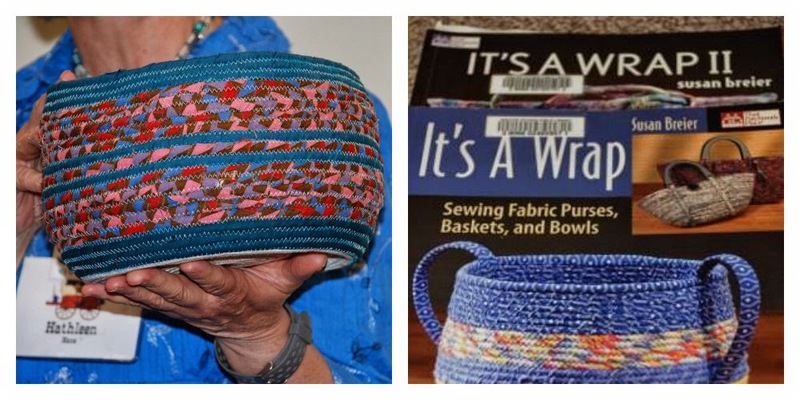 Look at how lovely some clothes-line, skinny strips, and a wide zigzag can become! And what a fitting end to our epic show and share! Thanks again to everyone who came. Meeting announcements are in a separate post, as are the instructions for Block of the Month. See you at the June meeting, Thursday the 19th, 7pm at Pearkes Rec. Centre.